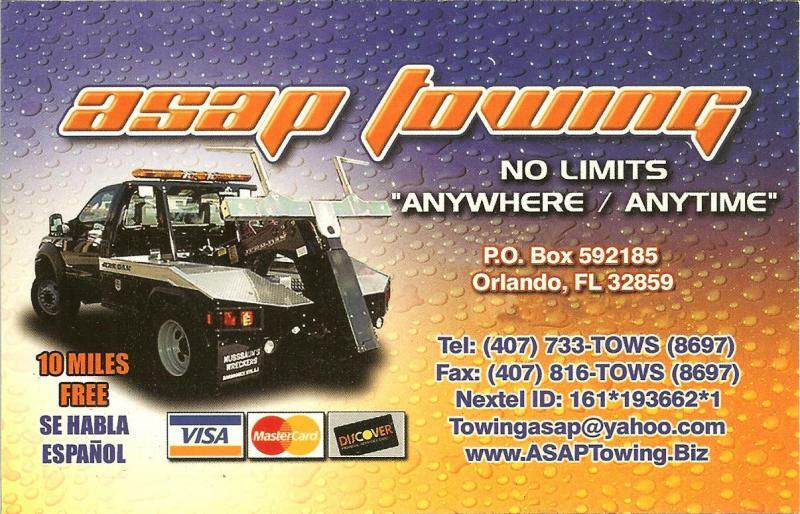 ASAP TOWING HAS SERVED THE ORLANDO AND SURROUNDING AREAS SINCE 2002. THE TRAINING PERSONNEL ARE IN THE TOWING INDUSTRY FOR OVER 20 YEARS. EVERY DRIVER IS TRAINED FOR ATLEAST 20 HOURS AND TESTED BEFORE OPERATING A TOW TRUCK. THEY ARE ALL TRAINED WITH RESPECT TO SAFETY, COURTESY, CUSTOMER SERVICE AND PROFESSIONALISM. OUR TRUCKS ARE FULLY EQUIPPED AND INSURED AND OUR DRIVERS ARE LICENSED/EXPERIENCED. OUR WORK PLACE IS DRUG & ALCOHOL FREE AND OUR STAFF ARE TESTED REGULARLY. CURRENTLY WE POSSESS WRECKER TOW TRUCKS & FLATBED TOW TRUCKS, WE ARE QUICKLY EXPANDING. OUR GOAL IS TO PROVIDE SPEEDY AND AFFORDABLE SERVICE. WE TRAVEL ANYWHERE AND ANYTIME AND OUR SERVICES ARE 24 HOURS/7 DAYS A WEEK. WHEN WE SAY NO LIMITS - WE MEAN IT !!! OUR PRICES ARE REASONABLE AND AFFORDABLE. WE LOOK FORWARD TO SERVING YOU.